Back on October 2016 I released a Free Gear VR game called Twobit. The feedback I received from players all around the world was very positive, the game hit 70k+ downloads within a few months and was nominated for an award for the best VR mobile game of 2016! 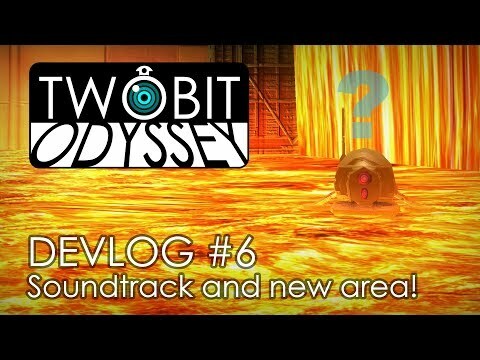 Twobit Odyssey is a full-on puzzle/platform game based on Twobit and currently features eight levels, four different environments and bosses, totaling hours of gameplay! The game also dramatically improved Twobit's control system and received high praises during beta testing. Twobit Odyssey is now available in the Oculus Store! Twobit awakens in a dark and mysterious place. But he is not alone. He sees you. You are his guide. When he asks for direction, look around the room and find a location for him to explore. When he finds a button, nod your head in agreement to activate it. Need to see what lurks in the dark? Activate the Twobit Vision and see the world through his eyes. But who is Twobit and, most importantly, who are you? Are you a figment of his imagination? When Twobit asks for direction, a question mark appears above his head and a round cursor allows you to pick a location to explore. 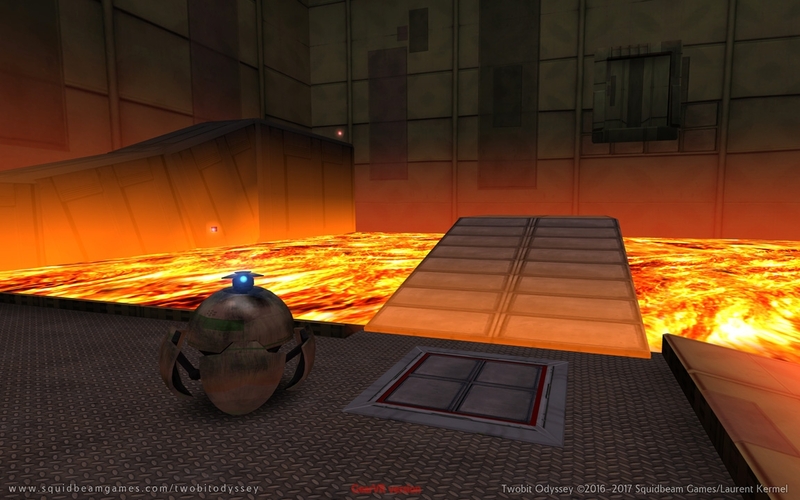 Once the robot has registered a new target, he then rolls into a ball and makes his way towards it. Some elements (such as buttons) can be activated by Twobit. When he reaches them, he will ask you if you would like him to proceed - you can confirm by nodding your head "Yes" in agreement, or by shaking your head "No" in disagreement. 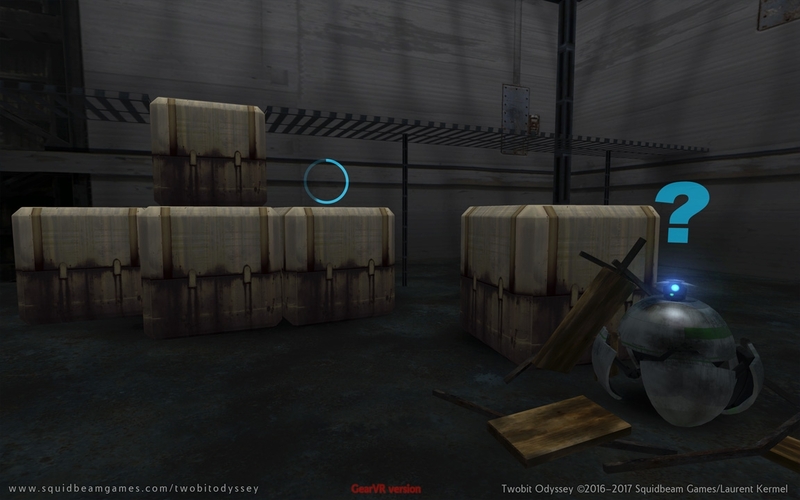 Players can activate the Twobit Vision at anytime during the game and see the world through Twobit's eyes. However, this feature is only useful when Twobit is opened and not rolled into a ball. The Twobit Vision gives players the ability to view the world they are exploring from another point of view. Additionally, Twobit can see things the players can't, such as flows of energy. 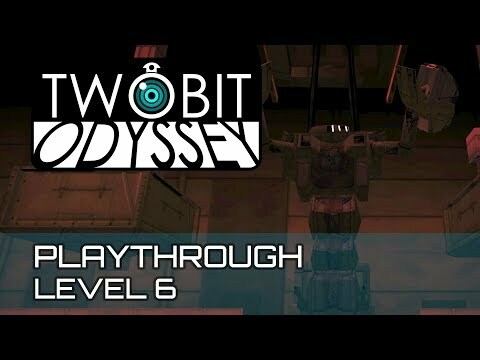 Twobit Odyssey features eight mind-bending levels, four different environments and four breathtaking bosses, totalling hours of gameplay. Players control Twobit only using their gaze via the VR headset. No need for a controller - players make choices by nodding "yes" in agreement, or shaking their heads for "No". 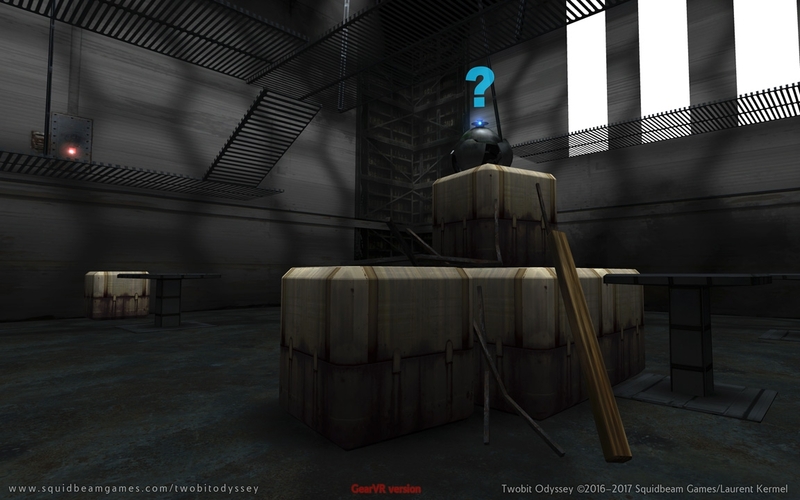 The gaze control system uses a novel approach and analyses the player's field of vision, and proprietary algorithms decide of what the player is most likely looking at. 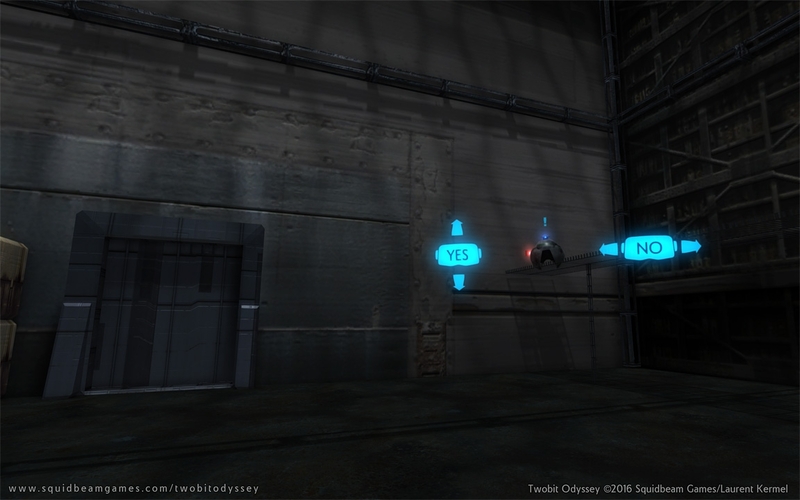 Twobit Odyssey was especially designed to prevent motion sickness, one of the main issues with first-person VR games. 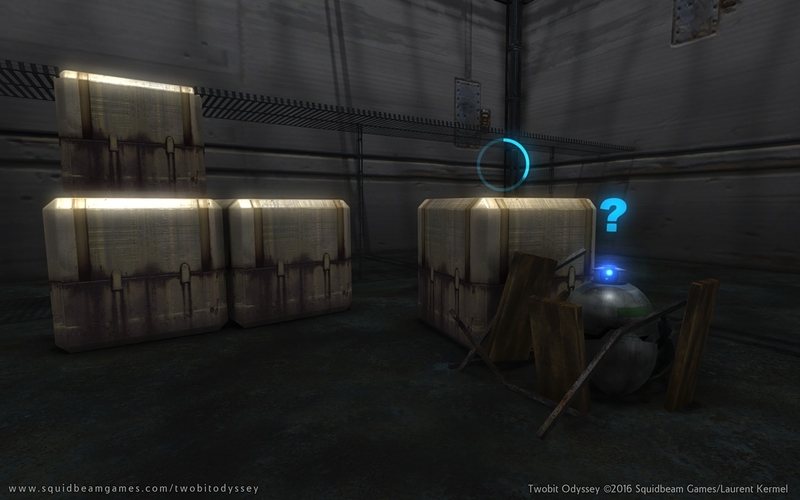 Special attention was given to the motion system; for instance the Twobit Vision is not available when Twobit is rolled into a ball and is therefore moving, thus preventing the player to feel dizzy. 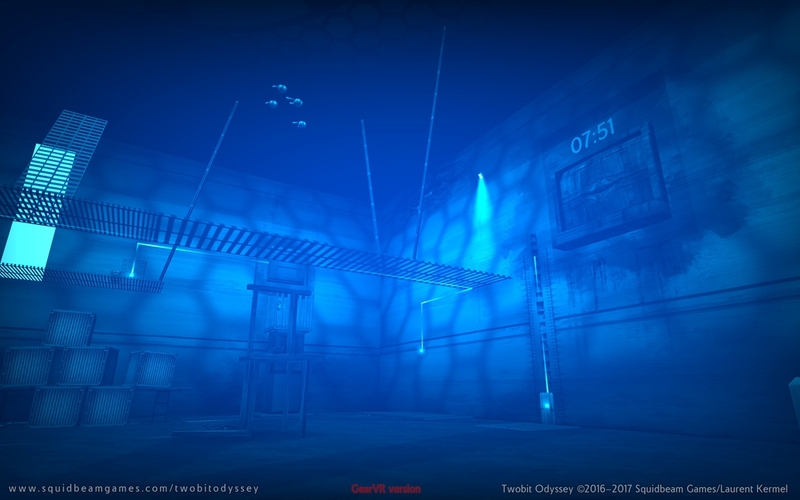 Sound design plays a major role in Twobit Odyssey. This allows players to know exactly where Twobit and other events are located in space without needing to always look directly at Twobit or the action. These techniques are especially important in creating a believable sense of immersion to the game. I am a solo indie developer and do everything myself, from art, modelling to coding and music. The process has more than its share of challenges, but also has more than its share of fun and exciting moments! Please don't hesitate to let me know what you think, be it positive or negative! There's a lot new features in the game, but in this video I show the new introduction screen as well as the new level progress option. The final game will have ten levels and you can now easily replay stages as you see fit! I've also started composing music for the game - this is not something I originally had planned, but many tested mentioned it, and it was time to bite the bullet! 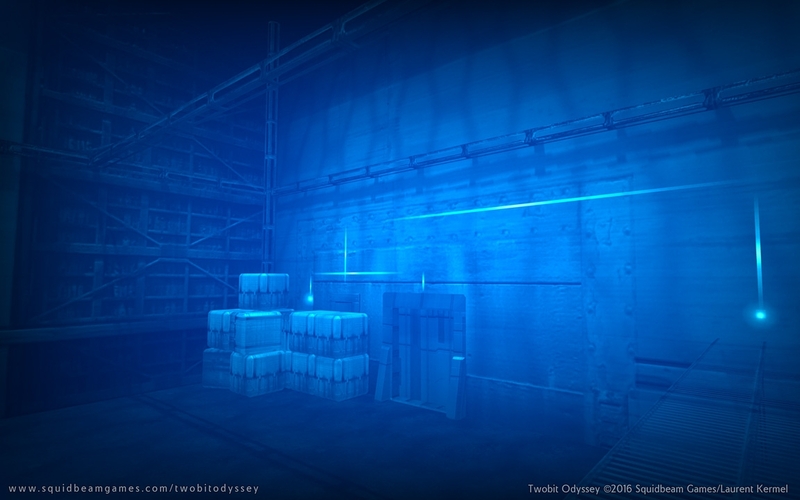 Then, there is a small sneak-peek at the second area in the game. Thanks again for watching, and please don't hesitate to comment, be it positive or negative. I'm still planning to release the game in October for the Gear VR first. 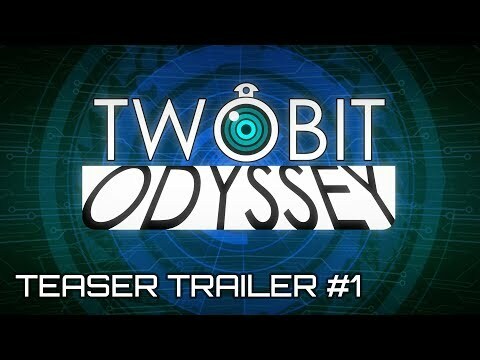 Here is the first teaser trailer for Twobit Odyssey! I'm still on track to release the game by the end of the year - it will be first available for the Gear VR and other platforms will follow! Hi everyone! 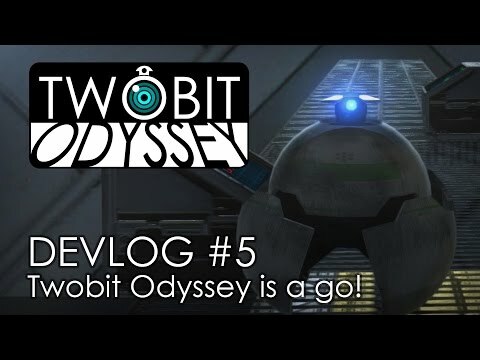 I'm getting really close to finishing Twobit Odyssey! I'm still planning to release the game for the Gear VR in November! Closed beta testing is on right now, please let me know if you would like to test the game (although the list of beta testers is already fairly full...). 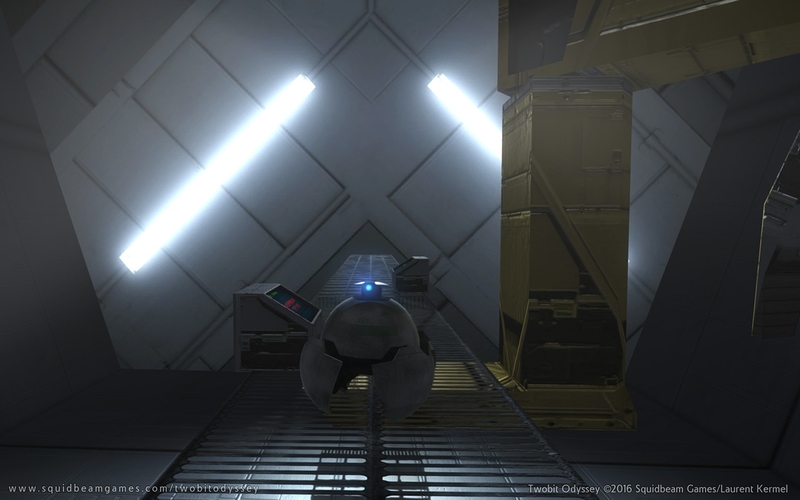 Here are more screenshots from the upcoming Gear VR version! 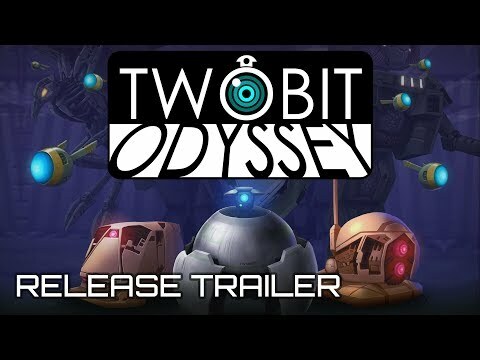 I just published the release trailer for my upcoming VR game TWOBIT ODYSSEY which will be first available for the Oculus Gear VR in November 2017. That's if everything goes according to plans. Other platforms will follow such as the Google Daydream and Oculus Rift! I'm really on the last stretch now, fixing minor bugs and adding as many features as possible before release (being a solo-dev is intense!). Closed Beta testing went really well and I thank everyone who participated, your help was very much appreciated! 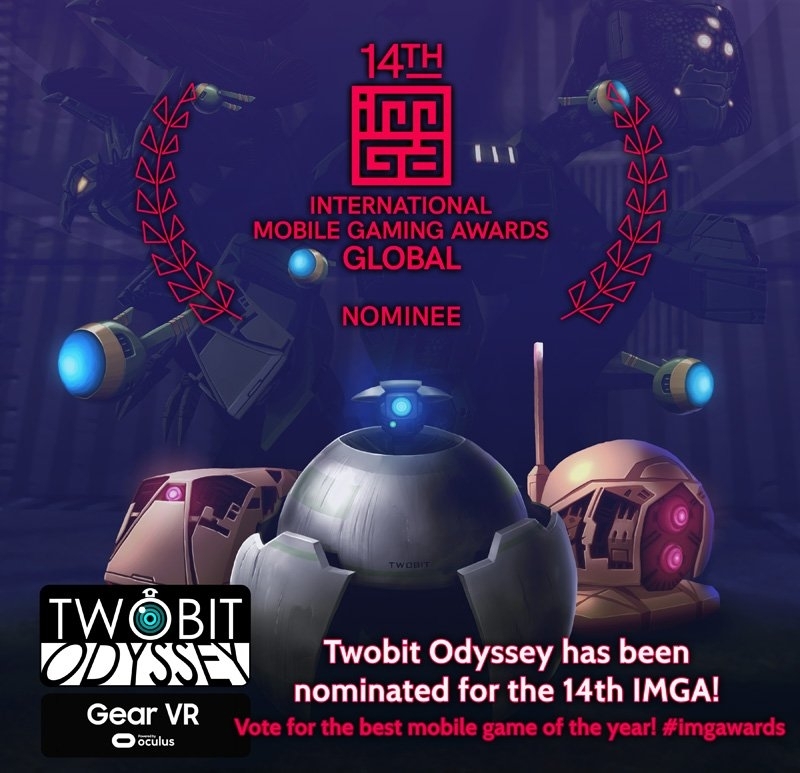 I'm delighted to announce that my VR game Twobit Odyssey has been approved by Oculus and the Gear VR version will be released next Wednesday, November 22nd! It will also be in the main section of the Oculus store! I'm delighted to announce that my Gear VR game Twobit Odyssey is now available in the Oculus Store! Twobit Odyssey has been in the making for a whole year and is ready to fly with its own wings. 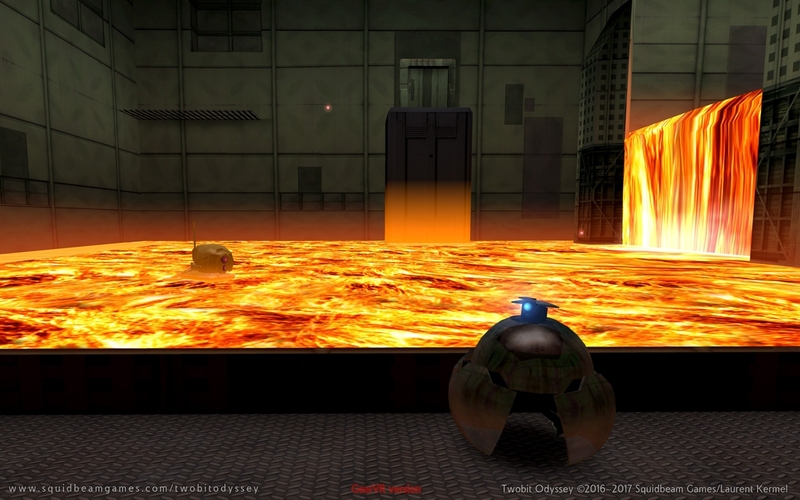 The game currently features eight levels, four different environments and bosses, totaling hours of gameplay. I hope you will like it! Me and Twobit wish you all Happy Holidays! 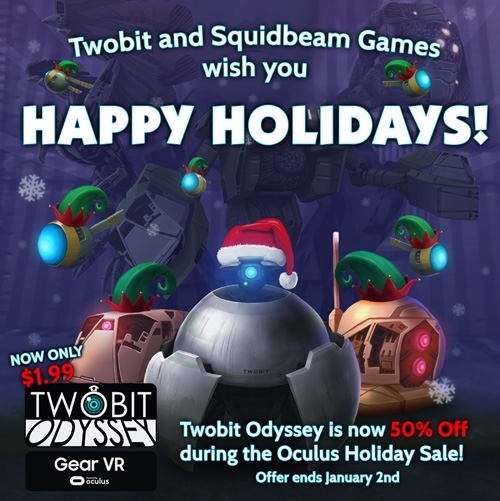 My Gear VR game is part of the Oculus Winter Sale and you can now bring home Twobit for half the price of an Egg Nog Latte! The whole cast of the game dressed up for the occasion and look incredible with their little hats that ooze winter spirit! Oh oh oh! Twobit Odyssey at $1.99 until January 2nd! 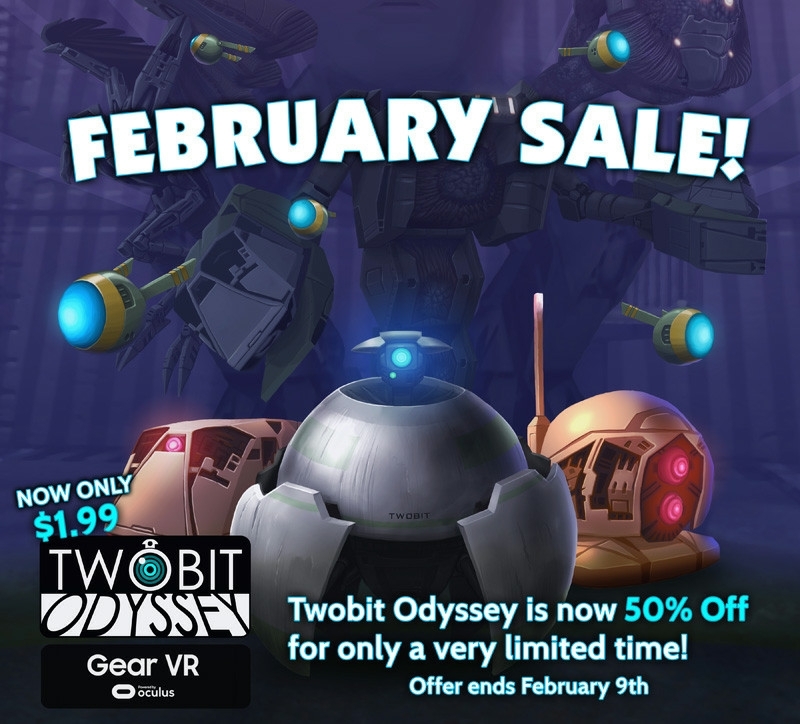 Twobit Odyssey is now 50% off for a short week! Twobit Odyssey at $1.99 until February 9th! Here is your chance to meet Twobit for half the price of a cappuccino! Spring is here! Let's celebrate all the things that make Spring so special, including bargains! 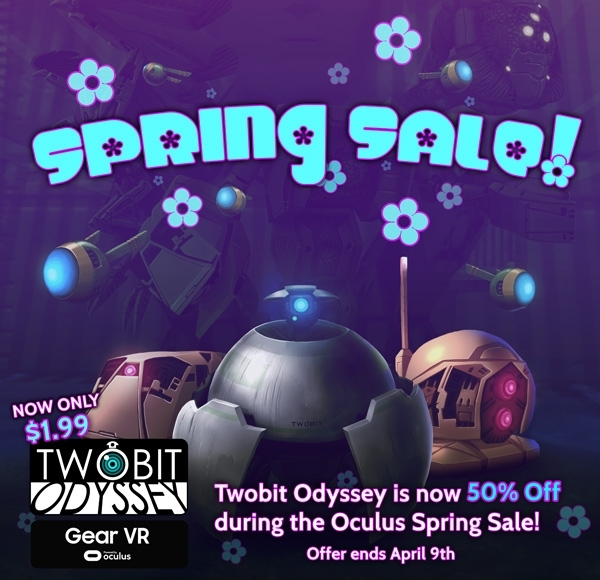 Twobit Odyssey is now 50% Off during the Oculus Spring Sale! You can now bring Twobit home for half the price of an iced tea! 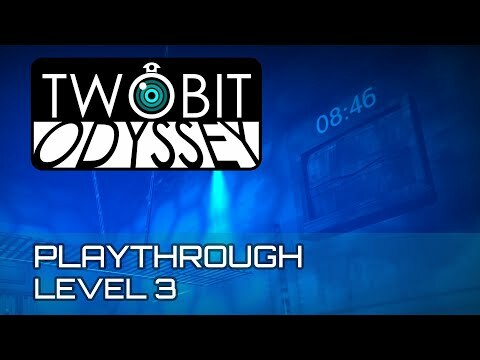 Twobit Odyssey is $1.99 until April 9th! Hello Summer! Summer is officially upon us, meaning it's time to kick back, bust out the flip flops, enjoy some outdoor time during the day and play more VR in the evening! 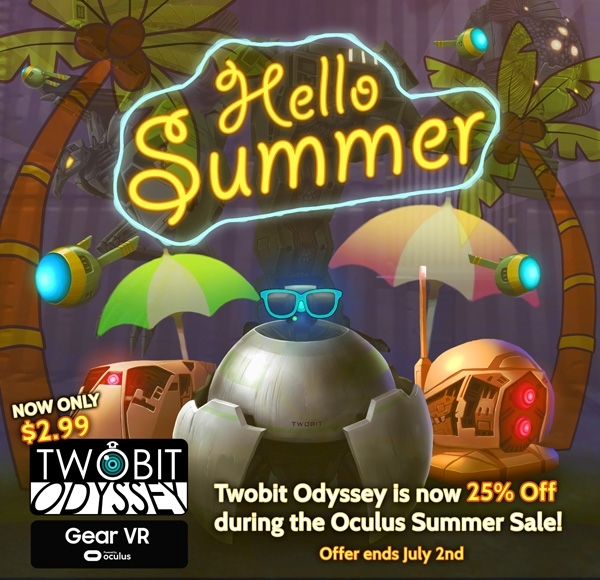 Twobit Odyssey is now 25% Off during the Oculus Summer Sale! You can now bring Twobit home for the price of an ice cream! 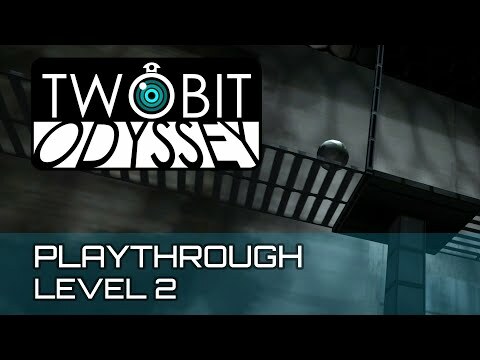 Twobit Odyssey is $2.99 until July 2nd! 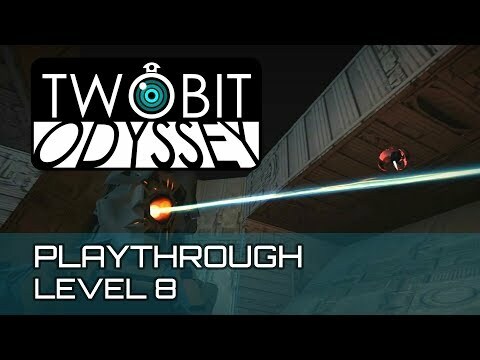 I've had a full playthrough of my Gear VR game Twobit Odyssey on the back burner for a looong while! But I've just started uploading it to Youtube! The first four levels are now available to watch! Please enjoy! 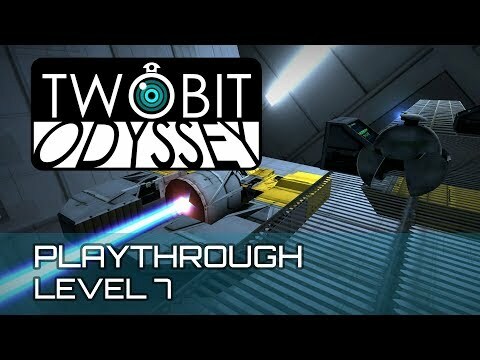 You can now also play Twobit, a free demo of Twobit Odyssey! 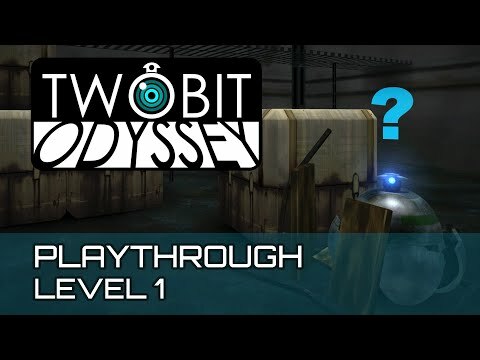 Here is the second and last part of the full playthrough for my Gear VR game Twobit Odyssey! Looking back at it, it took me a whole year to develop the game and, as a solo developer, I am still amazed that I pulled it off. Although I've been making games as a hobby for 30+ years, releasing a finished and official game was a very exciting adventure - and, most importantly, it showed me that I could do it! I've now been busy working on my next game and you can see some early images there if you're interested (http://www.squidbeamgames.com/bnm/index.htm). Let's make games! Thank you! The game has been out in the Oculus Store for almost a year (Gear VR) and although sales have been fairly low, I consider it a personal achievement. And I have also learned so much, especially about marketing, branding and publishing. Looking forward making more games! Let's celebrate Oculus Connect 5! 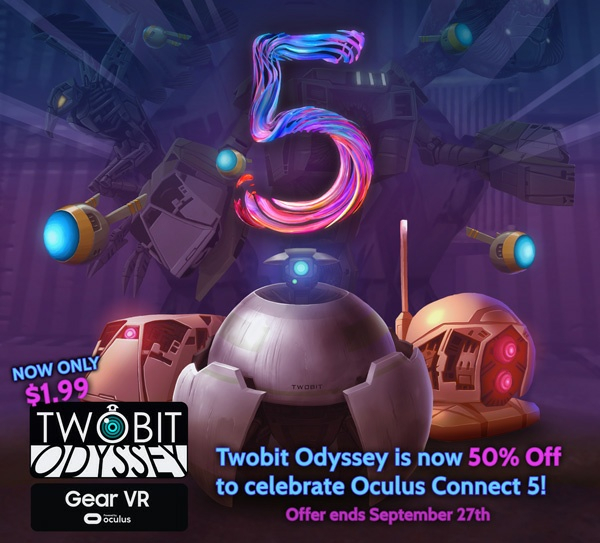 Twobit Odyssey is now 50% Off during the VR community's biggest annual event! 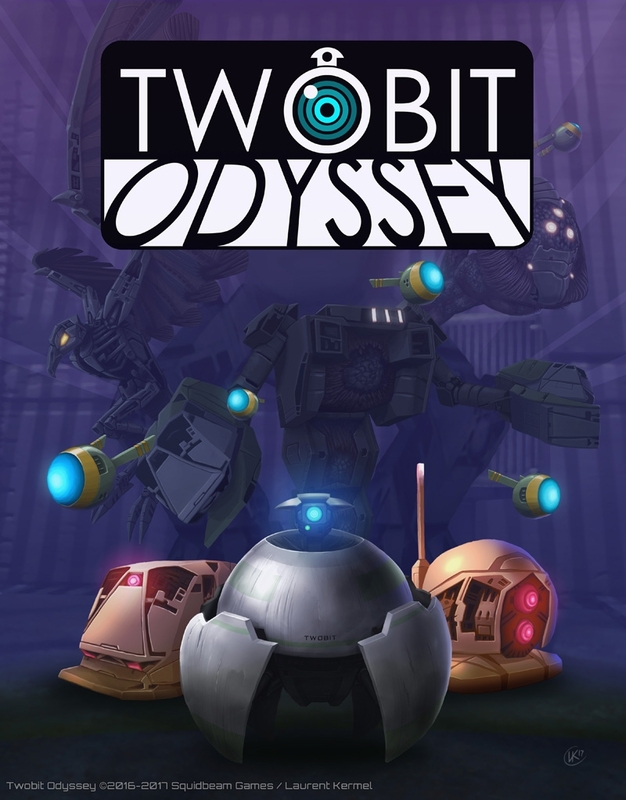 Twobit Odyssey is $1.99 until September 27th! 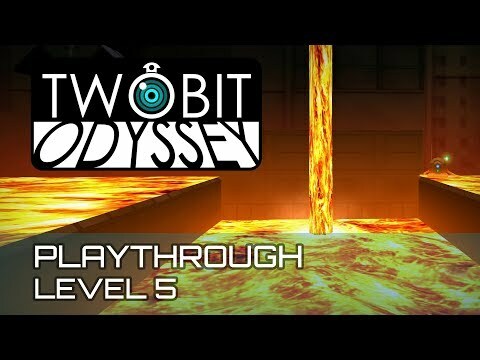 Don't forget you can also now play Twobit, a free demo version that features the first three levels from Twobit Odyssey! As some of you may already know, my Gear VR game Twobit Odyssey has been available on the Oculus Store for a while, but I've never had the opportunity to add support for the awesome Gear VR Controller! I know, it is long overdue, life got in the way as it always does, but this is about to change! Most importantly, I will push the game to the Oculus Go (which I love!) once done! I released a quick Facebook video showing the new control scheme in action! Done! Twobit Odyssey now supports the awesome Gear VR Controller and is also fully compatible with the incredible Oculus Go! Yeah! The VR Controller adds a LOT to the game - I had to change parts of the gameplay to make it work but I feel that it makes the whole experience a lot more fun!!! Here is Twobit Odyssey for the Oculus Go! 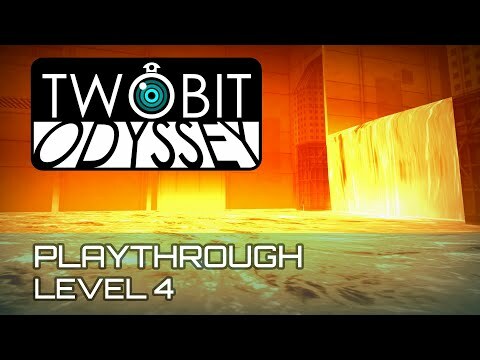 And don't forget, you can also try Twobit which features the first three levels from Twobit Odyssey for FREE!